This page contains affiliate links meaning I earn a commission if you use those links. Please read my disclosure for more details. I get questions all the time about certain contest and reward websites, and the legitimacy. With the insane amounts of websites offering you cash rewards and prizes it can be hard to tell which ones are the best and actually give you cash or prizes. 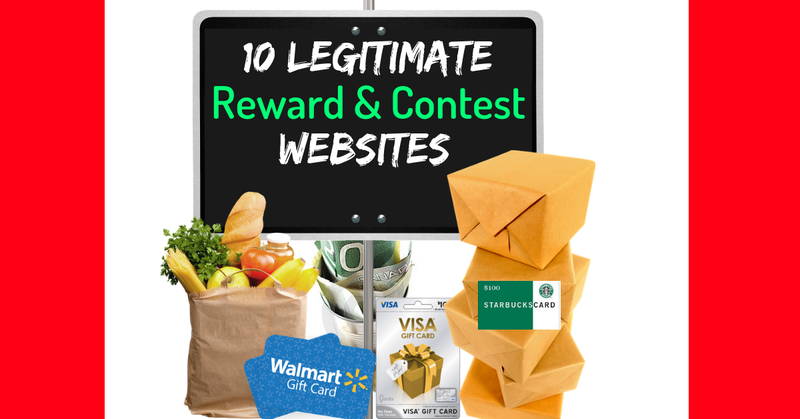 I am here to alleviate some confusion for you - These 10 contest and rewards websites are totally legit safe and actually pay out. After completing several cash outs and receiving fast payments and reliable offers these 10 are the top favorite list. Royal Draw - Contest and rewards website. Enter daily gift card giveaways and earn points every time you enter to win. Your free points can be redeemed for gift cards. Totally free and totally legitimate. We have cashed out numerous gift cards and won gift cards twice in the last few years. Pinecone Research - Must be between the ages of 18-34 to be accepted in. This is a top favorite surveys reward website program. MobileXpression - Get a FREE Amazon gift card within one week of downloading the app. You donwload the app and let it run in the back ground of your phone. Earn points every week that you have it installed and redeem those points for free amazon gift cards. Legerweb - Canada's highest rated opinion panel with monthly prizes and high paying surveys. We have done surveys paying $10 and it's only a $20 cash out minimum. Prize no. 4: 1000 air miles rewards miles, prize no. 5: an ipad®. Ebates - Top shopping rewards website. Get cash back on purchases and even make money with family and friends. One of Canada's favorite ways to get cash back. InstaGC - Earn reward points doing super easy tasks and answering surveys. You can redeem your points and INSTANTLY get your PayPal cash, Amazon gift cards and more. Harris Poll - This is a favorite of Starbucks lovers. Complete surveys and redeem for free Starbucks gift cards and more. A survey rewards website. Checkout51 - Favorite grocery cash back app that also offers cash back on Alcohol purchases. Caddle - Grocery cash back app. Get real cash back on your everyday grocery purchases.